The Pot Belly stove becomes a dear friend during Christmas with the cold winters in the mountains of West Virginia. In early fall, Dad would buy a load of coal from one of the local mines and hire someone to bring it to the store and shovel it into the coal house. I am not sure, but I reckon $25 would buy enough coal to get us through most winters. The store was longer that it was wide, with no insulation, two large display windows in the front and two smaller ones in the back. The stove sat in the center of the floor, but near the rear of the store and gave off very little heat on cold days, outside a radius of about ten feet. You could pretty much gauge the outside temperature by the customers. On cold days, they made a bee line to the pot belly stove, for it was there that they could chase the penetrating chill from their bones, as well as, catch up on the week's gossip, join in on the never ending checkers tournament or spin a tale or two. For those who have not experienced the deep soul warming effect of a Burnside Pot Belly Stove, it does a darned good job - one side at a time. To get the full effect, you have to become a vertical rotisserie, because just about the time your front is all warmed up, your back side is getting colder, so you have to keep turning, all the while keeping your hands close to the heat. We called it the "Pot Belly Shuffle". Making sure the stove was full of coal was the unspoken responsibility of whoever was closest to the coal bucket. But, it was the job of my brother and me, to clean out the ashes and fill the two coal buckets before we headed off to school in the mornings, and to repeat the same routine in the evenings when we came home. This was a task much appreciated by the early patrons, as Smith's General Store was open from 7:00 am to 8:00 pm during the winter months. The store took on a special air at Christmas time. Dad would order in some exclusive stuff that he only stocked once a year, like chocolate covered cherries, chocolate drops (you know what I mean, a chocolate shell with sweet creamy goodness inside) and, of course, peppermint candy canes. He would also get a shipment of wrapping paper and ribbon, string, tape and tags, and place them in a Christmas display, on a reserved spot just beside the cash register, to be certain the ladies could find them. In the food department, he would order an extra supply of packaged dried fruit, sugar, flour, nuts, cinnamon, nutmeg, canned pumpkin and sweet potatoes. Because folks would be making or buying gifts, a couple of bolts of festive material, a few extra boxes of galoshes, five-buckle artics, gloves, scarves and toboggans, and whatever other items Dad thought people would need or want, were added to the store's normal inventory. Mom would decorate one of the display windows in the front of the store by spreading out a soft cotton sheet and strategically placing the Nativity scene in a place of prominence. My brother and I would cut snow flakes from folded paper and, using thread, hang them as if they were floating in the air above the Nativity. 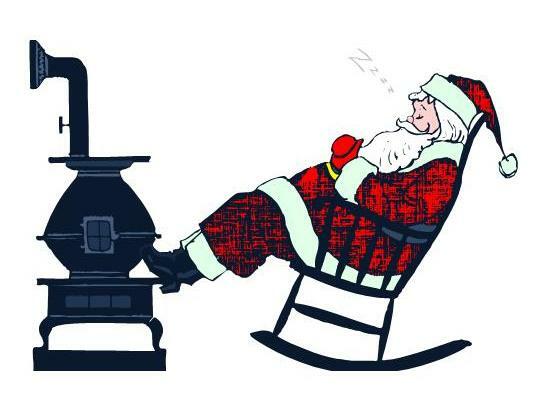 You know, the closer Christmas got, the further the warmth of that old pot belly stove seemed to radiate. People started taking on a special sort of spirit and their troubles and cares of life were overshadowed by wishing one another peace and goodwill. For a period of time, losing at checkers seemed less personal, the tales a little more believable and the gossiping was only about good things. It was Christmas time at Smith's store and the Pot Belly stove seemed to radiate more than heat.